iDynamics Purchase Rebates allows you to setup rebates targets associated with suppliers and obtain forecasts on the status of these targets. It is an easy to setup and quick to implement extension whose benefits will be noticed by suppliers and customers. In this section you will find information that will help you to configure and use iDynamics Purchase Rebates in your company. If you are a partner or a customer who needs to extend this functionality, you will find important information in the Developers section. Rebates groups allows us to setup the different types/groups of rebates that has the supplier. 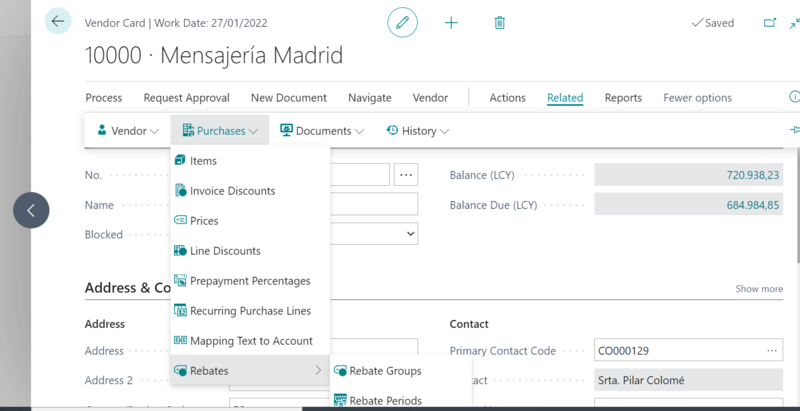 Rebates periods is where the different targets are set by date period, and from where you can obtain a report on the status of the achievement of these targets. In addition, the latter report is also available in the list of suppliers, both from the Start tab and from the Report tab. Finally, within the different purchasing documents, we will be able to see at all times if the lines we are inserting fall within the supplier's rebates objectives, or not, and the group code in which they will be included.